Okay, I realize that all things pumpkin are associated with fall and that Christmas is just days away. 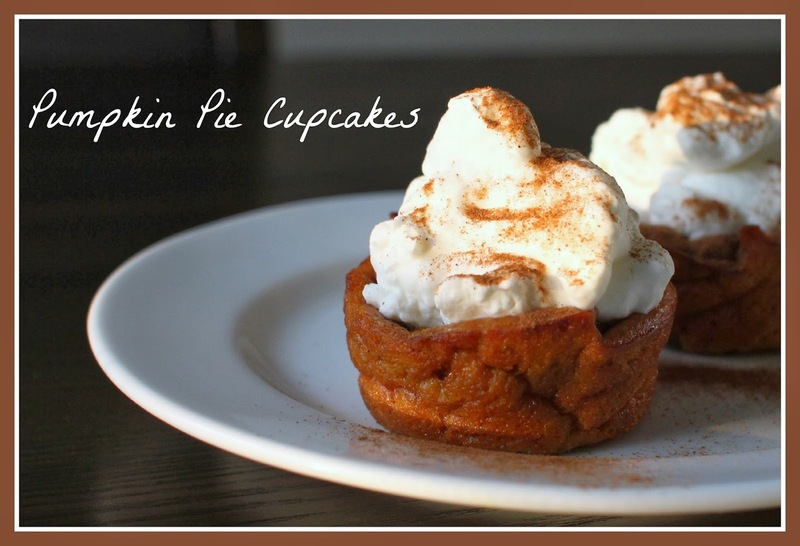 But, on this last day of fall I want to share my favorite pumpkin discovery of 2013: these awesome pumpkin pie cupcakes. So here's the deal. They are handy and portable like a cupcake, but they have the consistency of pumpkin pie, crust and all, without doing all of that work. The outside is firm, yet tender and the inside has a custardy consistency. How is that even possible? It's like baking magic! If you make these, please take the extra few minutes to make fresh whipped cream. I promise that it takes these cupcakes from good to great. 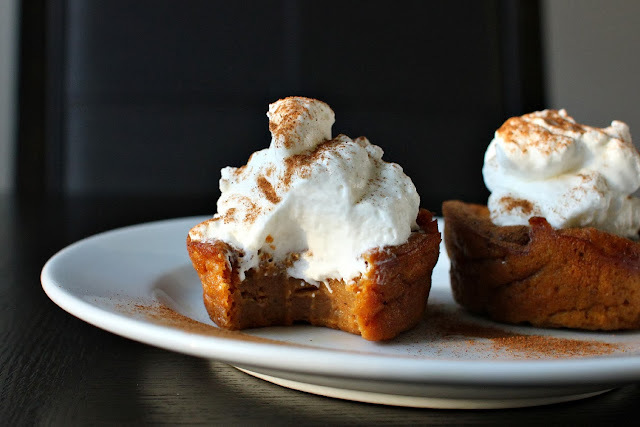 Imagine soft, custardy pumpkin pie in a portable form topped with a cloud of sweetened whipped cream. These cupcakes are elegant enough for a party or a special dinner. They are just too cute! And I promise, they are so close to the taste of traditional pumpkin pie that you may actually prefer to make them. Don't limit this recipe to fall... or even dessert. I like to enjoy one with my morning coffee, too. Preheat oven to 350 degrees. Spray a 12-cup muffin pan with cooking spray. Don't use paper liners - the cupcakes will be impossible to remove. Mix the pumpkin, sugar, brown sugar, eggs, vanilla extract, lemon extract and milk. Add the flour, cinnamon, nutmeg, salt, baking powder and baking soda to the mixture. Fill each muffin cup with 1/3 cup of the mixture. Bake for twenty minutes and let cool for twenty minutes. Remove cupcakes from pan and chill in the fridge for 30 minutes. 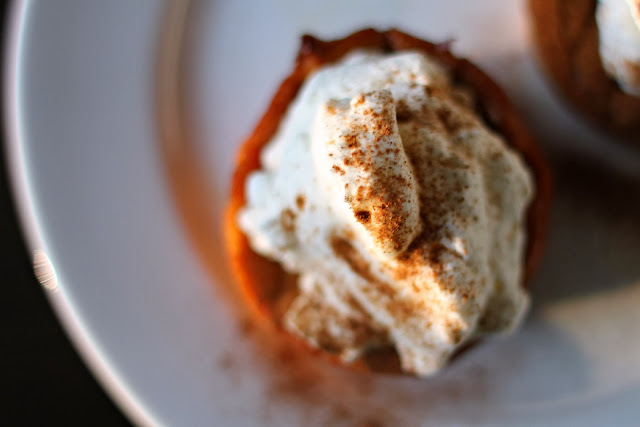 Top with fresh whipped cream and sprinkle more pumpkin pie spice on top and serve. Makes 12 cupcakes. I love the way this is written and the pics look scrumptious. I want some right now!!! Lol!! Not only do these like so good, but they're adorable. I could go for these on this rainy day.